If you are interested in a used DPF with an unknown number of miles, then a “reman” DPF is for you. In the trucking industry a reman part is always synonymous with a component that has been taken apart and put back together with new wear parts. This is not the case with a DPF or DOC. The filter core makes up 99% of the value of the whole part so if it’s bad the whole part is scrap. Many believe these cores are replaced with a new filter core if the original core was bad. The reason many understandably believe this is because they are called “reman” filters. This is a blatant misrepresentation! The term we use, and the correct term that should be used in the industry, is “reconditioned” or “recon”. 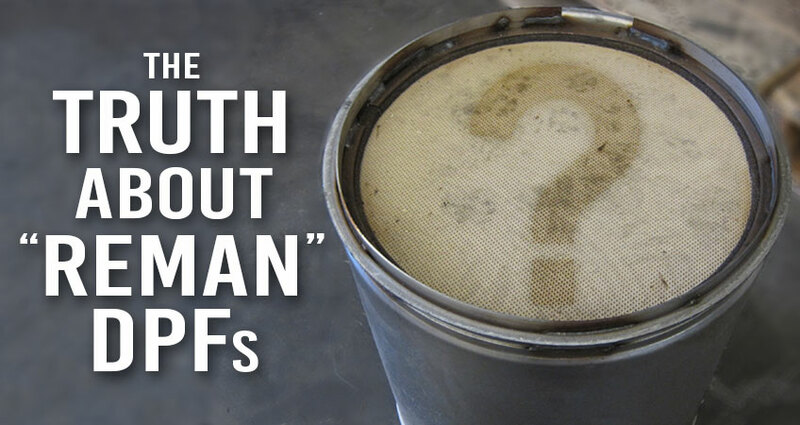 "Let’s be clear on what a “reman” DPF really is: it's a used filter that has simply just been cleaned!" Let’s be clear on what a “reman” DPF really is: it's a used filter that has simply just been cleaned! Keep in mind it was returned to the manufacturer as an exchange part for a reason! In order to truly and comprehensively inspect the condition of a used filter before declaring it worthy of the title “reman”, a fiber optics camera would need to be inserted down inside all 4,000 cells to check for micro cracks, melts, heat damage, hardened ash, sintering, hardened oil, etc. The time this would take on each filter would render a reman program financially infeasible. Now that you know a “reman” filter is used, what questions would you ask before you buy used equipment? How many miles are on the filter? What engine codes occurred during its life? What upstream component failures have occurred that would impact the life of the DPF? Were there any coolant, fuel or oil leaks? The answers to all of these questions will unfortunately remain unanswered. So, in order to realistically reman a DPF or DOC, the core would need to be replaced, which is essentially a brand new filter and therefore you cannot truly reman a DPF or DOC. If a DPF is not able to be remanufactured, then what is done to it? It has been reconditioned. This is why they are cheaper than a new OEM part and less than a new aftermarket DPF. The manufacturers make a killing on these because they are not replacing any worn parts. This is why they encourage you to swap out your filter for a “genuine OEM remanufactured” part. The more cores they get in the better they can sustain their program. Do you think they will ever come out with the truth that they have misrepresented these as “reman” DPFs? It is very unlikely because no one seems to be concerned… except the State of California, which has passed laws that prohibit the sale of reman DPFs in that state.